Despite how Steve Jobs felt about stylus use in this ever-changing, post-PC world, styluses have actually grown to be an integral part of how some people use their iPads. While it's safe to say that most handwriting and sketching apps benefit from stylus use, only a few implement any type of wrist protection. This means that even with a stylus, you'll have to float your wrist above the iPad's screen to avoid any accidental input. Despite an app's built-in wrist protection, results tend to be hit-or-miss. Looking to end that problem is the Hand Glider. The Hand Glider is essentially half of a glove. 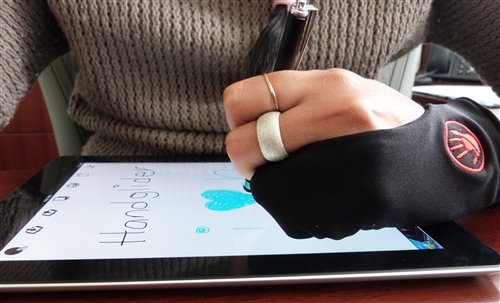 It covers parts of your wrist and palm, allowing you to use a stylus as naturally as you would a pen or pencil. After seeing the Hand Glider, I tried emulating its function with a cotton glove, but to no avail. It's a bit surprising that something like this hasn't popped up sooner. Conversely, gloves that work with capacitive touch screens have been available for quite some time. It's tough to say whether or not something like the Hand Glider is worth it. From my own experience, extended stylus use for writing and sketching on the iPad does feel noticably unnatural often sooner than later. However, we've been doing fine without the Hand Glider since the original iPad launched. Before you decide, check out the Hand Glider yourself. The one finger version will set you back $19.99, while the two finger variant will cost you $24.99. If you have any do-it-yourself solutions to the problem that the Hand Glider claims to solve, be sure to let us know in the comments!